The sleek and stylish Dell Slim Single Monitor Arm - MSSA18 seamlessly integrates with your monitor, freeing up space on your desk to provide a clutter-free, aesthetic workspace solution. With the ability to switch out the VESA cover, you can perfectly match your monitor to the arm for a more attractive-looking office. 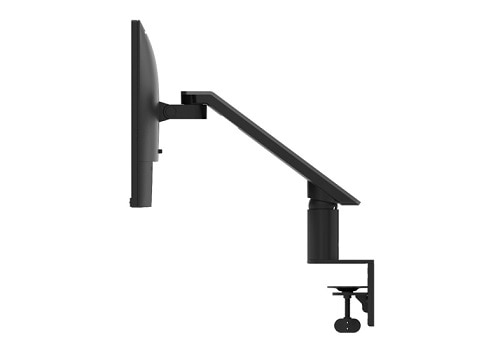 Maximize your desk space with the Dell Slim Single Monitor Arm's small footprint and slim design. With superior cable management, you'll be able to hide unsightly cables by neatly routing them through the magnetic cover of the slim arm. Plus, you get plenty of options to conveniently mount the arm to your deskâ€”either on the side, rear or through the grommet hole of your desk. Tilt, swivel 90Â° left or right, and pivot your monitor 90Â° clockwise and counter-clockwise, or adjust the height to suit your viewing comfort. With ample depth adjustment options, you'll be able to enjoy a better working posture and be more productive. Move your monitor to the back of your desk when you want to free up space for writing or bring it towards you to comfortably view up close. The arm is optimized for Dell UltraSharp and P Model monitorsâ€”so you can set it up quickly and easily. You won't need to use any tools or screwsâ€”with Dell Quick Release, simply click the monitor panel into place and you're set. 19' to 27' Dell UltraSharp and P Model monitors with Dell Quick Release.